This model dispenses coins at a high speed, up to 600 coins per minute. It maintains accuracy and prevents coin overrun with the use of two proximity sensors. This hopper is made by Asahi Seiko and is set to be used with $1 Australian Coins. This hopper is made by Asahi Seiko and is set to be used with $1 Australian Coins. Coin Dispensing Speed : approx. 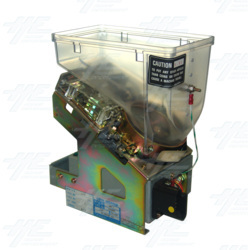 above 600 coins/minute(60Hz) Dispensing speed may vary depending on motor gearbox deceleration raito.